Is there a writer in you, just itching to burst forth? Here are 54 tell-tale signs! This is the sixth installment in a series of self-help tests to help secret writers and not-so-secret writers proclaim their affliction. Read here the fifth 56 signs that you might be a writer. Is there a writer lurking in you? If your spouse complains when you clean the furniture, because you remove only enough to form words in the dust, you might be a writer. If there is a lineup outside your local bookstore every morning, and the lineup is you, you might be a writer. 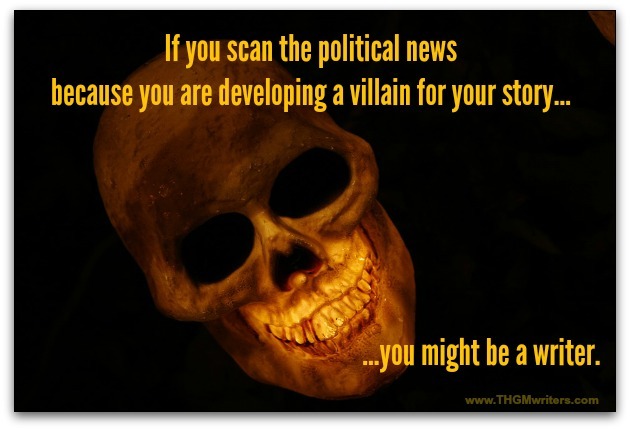 If you scan the political news because you are developing a villain for your story, you might be a writer. If you’ve ever fought to defend a dangling participle’s honor, you might be a writer. If all your best friends are invisible, you might be a writer. If you are always trying to read people, you might be a writer. If you still write post cards, you might be a writer. If you are taking notes while everyone else is watching the action on stage, you might be a writer. If you hate automated emails, because you can’t write back to them, you might be a writer. If an outhouse conjures up images of a quick place to hide from a chase, you might be a writer. If instead of a briefcase, you carry a file cabinet with you on the bus, you might be a writer. If your keyboard gets more use than your mobile device, you might be a writer. If you’ve ever petitioned city council for proper punctuation on stop signs, you might be a writer. If you walk up to people and whisper in their ears, “The Bard only knows…”, you might be a writer. If the first thing you think of on a rainy day is “It was a dark and stormy night”, you might be a writer. If you say “autobiography” when you mean résumé, you might be a writer. If you consider book burnings to be terrorist acts, you might be a writer. 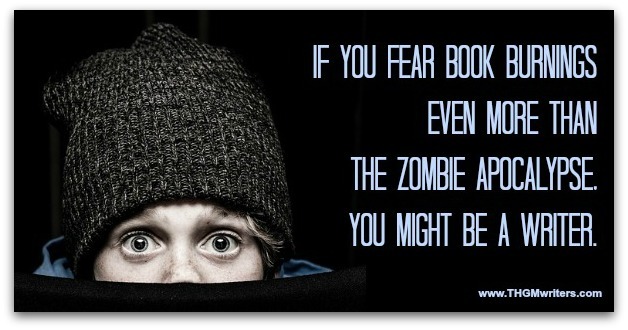 If you fear book burnings even more than the Zombie Apocalypse, you might be a writer. If you’ve ever dreamed that your pillow turned into a keyboard, and that explains why your partner can’t sleep, you might be a writer. If “Words mean what I want them to mean” has ever been your slogan, you might be a writer. If all your doodles seem to spell something, you might be a writer. If the first pass with your lawnmower spells a recognizable word, you might be a writer. If you vote for whichever candidate is the least non sequitur, you might be a writer. If the answer to “What has it got in its pocketses?” is a pen (of course! ), you might be a writer. If you’ve ever written a poem on the bottom of your shoe, you might be a writer. If there are two sides to every story, and you want to tell both of them, you might be a writer. If you’ve ever been diagnosed with “inkstain brain”, you might be a writer. If you think the worst tragedy in history was the burning of the library at Alexandria, you might be a writer. If you’ve ever shopped for a pesticide that works on editors, you might be a writer. If you spent most of your childhood nights with a flashlight under the blanket, you might be a writer. If you think living in an upper case neighborhood would be a capital idea, you might be a writer. 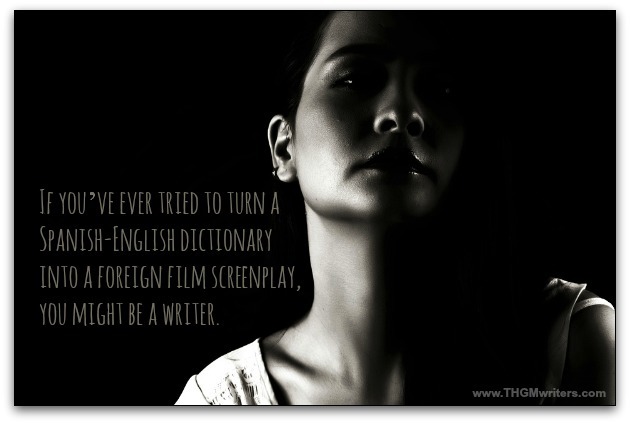 If you’ve ever tried to turn a Spanish-English dictionary into a foreign film screenplay, you might be a writer. If the war you fear the most is a war of words, because you know that the pen is mightier than the sword, you might be a writer. If you always perk up in church when the preacher says, “It is written…”, you might be a writer. If you’ve ever dialed 9-1-1 to report a split infinitive, you might be a writer. If you edit the cardboard signs that homeless people are holding, you might be a writer. If you think Alexander Hamilton was the hero of the Revolution because he got to write all of Washington’s letters, you might be a writer. If your way of preparing for the risks of Ebola and SARS was to sketch out disaster plots – oops, I mean plans, you might be a writer. If you really should change your pajamas after nine days straight, you might be a writer. If your idea of an April Fools joke is to put fake dust jackets on somebody’s books, you might be a writer. If your main concern with climate change is that rising seas might flood coastal libraries, you might be a writer. If you have calluses on your fingertips, you might be a writer. If you’ve ever written a back cover blurb for a user manual, you might be a writer. If you’ve ever sat in a graveyard, seeking inspiration, you might be a writer. 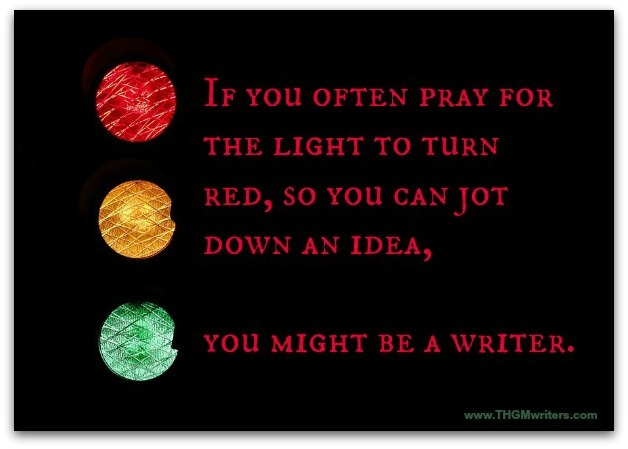 If you often pray for the light to turn red, so you can jot down an idea, you might be a writer. If you admire the Cambodians, because their alphabet has the most characters, you might be a writer. If your favorite musical is Hamilton, because it has three times as many words as Phantom of the Opera, you might be a writer. If you often find yourself updating your list of top 10,000 favorite books, you might be a writer. If you have ever assigned personalities to the vegetables on your plate, you might be a writer. If your career ambition is to go back to school, you might be a writer. If you have ever gotten high on a sonnet, you might be a writer. If you always stay behind to read the movie credits, you might be a writer. If you think that “verbs” is one of the four basic food groups, you might be a writer. If you still write notes for you kids’ lunch boxes, after 27 years, you might be a writer.